The bedroom is best described as your own private sanctuary. Choosing the perfect carpet for this sanctuary in the home depends on whose sanctuary it is. Both master and guest room bedrooms most likely will have the least amount of foot traffic or potential for soiling or stains. Bedrooms for active children or teens that are always on the run are surely rooms that are much harder in terms of foot traffic, mishaps and clutter. Often in master bedrooms, softness and luxury are two key elements in creating your perfect sanctuary. 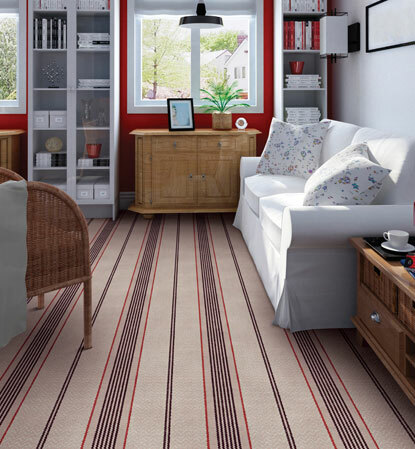 Wool, nylon and polypropylene carpets in plush or textured styling will perform well. Solids in either strong or soft colors are ideal. 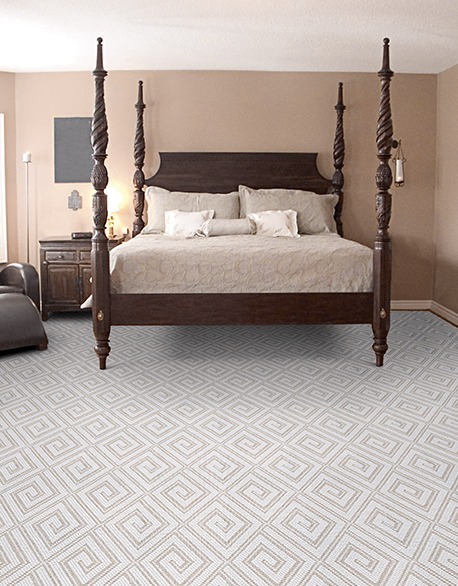 Wiltons with cut and loop piles and simple patterns of geometrics or design motifs will visually enlarge your bedroom and provide your floor with a sophisticated appearance. For those active children and/or on the run teen bedrooms, spills and stains should be your main concern. Multi-colored carpets and in textured constructions rather than solids will be more forgiving and will hide mishaps. Carpets that feature stain resistant nylon and/or heat-set polypropylene fibers would be the safe choice. Often referred to as the heart of the home—the room where families come together and people gather when entertaining. Living rooms should be designed for multi-functional purposes with the idea of entertaining as many people at once. Your personal tastes and lifestyle, no doubt will play a major role in selecting a carpet for your living room. Formal or traditional living rooms can be enhanced by a number of different carpet constructions including cut-pile for a classic look, multi-level loop or cut and loop patterned Wiltons for a sophisticated appearance, which can also be utilized in modern décor. 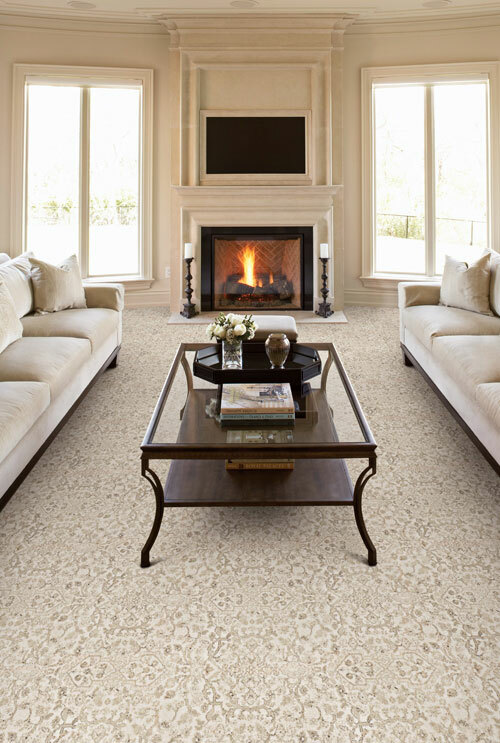 Textured, plush carpet in neutral tones, some of which may have multiple textured appearances, will provide a living room with a sense of security and relaxation, perfect for casual living. If your living room is often busy with children and pets, soiling and stains should be of concern. Multi-colored carpets with fiber contents of either nylon or wool may be your solution to hiding such possible mishaps. Always considered the movement or weight of furniture, wool, nylon and heat-set polypropylene carpets will provide great resiliency. While other rooms in your home may have multiple purposes, your dining room should be considered as the entertaining mecca of your home. Many consider the dining room as your space in the home that should showcase your signature style. A dining room will have heavy furniture pieces, you will also have to deal with the movement of chairs, as well as accidents from food and drink spills. Wool carpets and synthetic fibers such as nylon are easy to maintain and clean. Multi-colored and patterned carpets have the advantage of disguising spills; an all-over pattern that is not hidden by the dining room table would be a good choice. Patterns that repeat in particular stripes or geometrics can be used to make the room look wider or longer. Loop pile, cut and loop and multi-level loop piles will give you a luxurious appearance. Typically the central spot in your home, the family room should be designed as a space where families gather to play and relax. It’s important that the carpet in your family room provides a sense of comfort and coziness, as members of your family will most likely spend a portion of their time on the floor in this room. Durability, easy to clean, color, style and softness should all be factored in your decision-making. High-traffic, within family rooms should always be of concern, look for carpets with high texture retention and density. 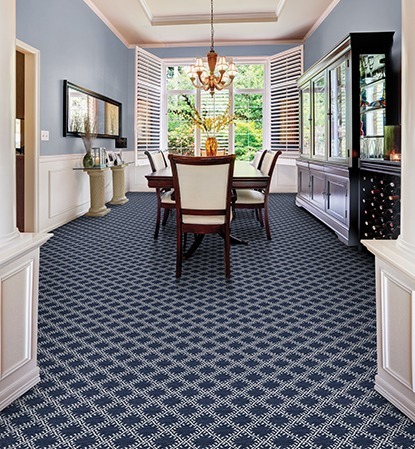 Wool and heat-set polypropylene carpets contain high durability factors and will give you a number of design and color options, allowing you to create a certain lifestyle in this important room in the home. Multi-colored and low, textured loop pile carpets are your safe choice in this room and will be forgiving in regard to everyday mishaps. An informal living area, basements are becoming more and more an opportunity for you to create a room of your choice. Game rooms, home theater sections, additional casual family space are all realistic opportunities. 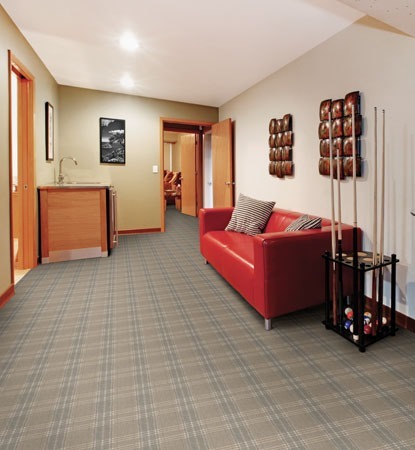 Carpets made of polypropylene and nylon in a dense, multi-loop or level loop pile constructions are a solid choice for basements. Quality carpet padding will help the overall performance and lifecycle of the carpet, however if the padding is too dense, water could get trapped underneath. Because they are often used, stairs like hallways face a high-rate of foot traffic. It is recommended that the highest durability rated carpet and padding be chosen for these areas of the home. High density, cut-pile or tightly looped pile carpet will stand up to repeated use and is resilient to footprints and ground soil. 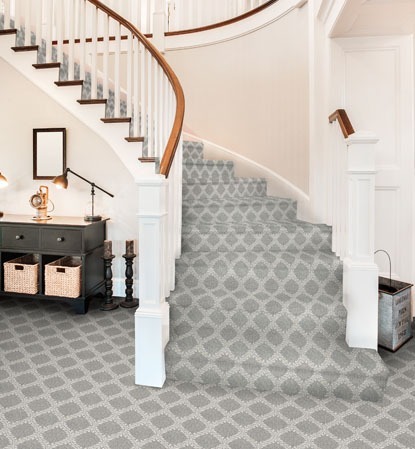 In addition to carpet, which in many cases would be used to completely cover stairs, Couristan offers an assortment of roll runners available in 26” and 31” widths and can be cut to your desired length. Creating a quiet workspace in your home to pay bills or to catch up on your work responsibilities has become more and more popular in today’s households. Low pile carpets provide easier movement for office chairs on wheels and better resilience for heavy office furniture and true workstations. A level loop pile carpet compared to a multi-level loop pile of varying pile heights would be recommended to avoid snags or pulls. 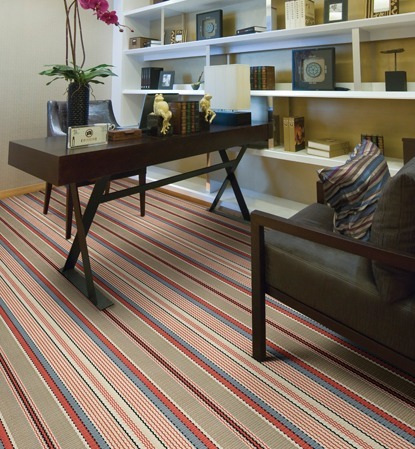 For a less industrial look, a patterned cut and loop pile carpet may be the alternative. Most cut and loop pile styles feature short cuts paired with a tight level loop. This will provide a more decorative look for your home office. Protective chair pads are recommended under home office type chairs with roller casters to preserve the appearance and to avoid premature or accelerated wear of carpet. Today’s home extends beyond interior rooms, bringing fashion, form and function to outdoor spaces has become increasingly popular. Dressing up patios, pool-side gathering spots and backyard relaxation areas as well as sunrooms with weather resistant accessories has become the hottest trend. 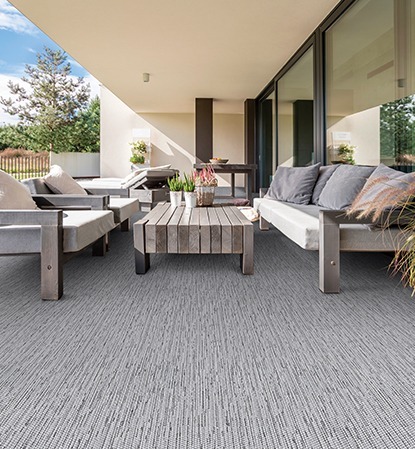 A majority of indoor/outdoor carpets sold today are flatwoven of 100% polypropylene (backing and surface). This type of construction and fiber usage makes them highly colorfast and highly resistant to fading due to sunlight and UV exposure. Stain resistant, these types of carpets are easy to clean and maintain. In addition, these flatwoven carpets are mold and mildew and water-resistant. Advancements in both color and pattern usage within this category will allow you to create an attractive area outdoors that is suitable for the indoors.